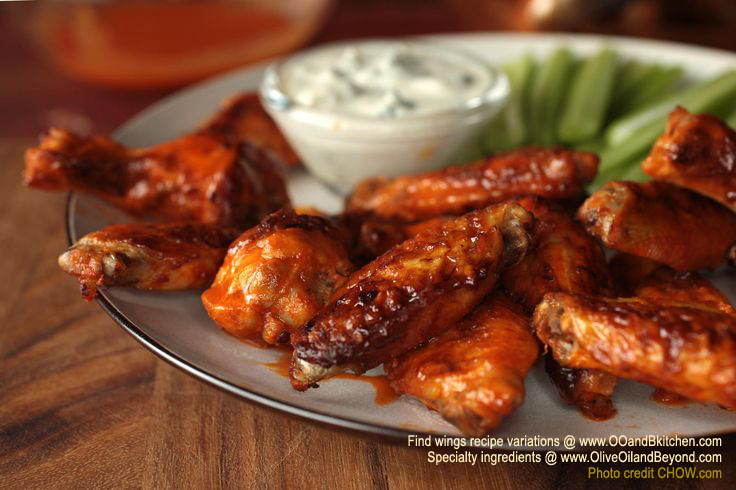 Spicy wings have become a popular appetizer, in particular, surrounding sports and game-watching gatherings! They are easy to prepare, finger-friendly and offer several variations on flavorings, from barbecue to buffalo. Enjoy our tangerine variation on this original recipe calling for a ginger soy glaze. We like our wings tangy and spicy, so we also recommended our pink pepper olive oil, or hot habanera EVOO! So get your tastebuds ready for some MARCH MADNESS! Mix first 4 ingredients in a medium bowl; let stand for 5 minutes. Whisk in hot sauce; keep warm. Bring all ingredients and 1/4 cup water to a boil in a small saucepan, stirring to dissolve honey. Reduce heat to low; simmer, stirring occasionally, until reduced to 1/4 cup, total, approximately 7–8 minutes. Strain into a medium bowl. Let sit for 15 minutes to thicken slightly. *Sauces can be made 3-5 days ahead. Let cool completely; cover and chill. Rewarm before using. Preheat oven to 400°F. Set a wire rack inside each of 2 large rimmed baking sheets. Place ingredients in a large bowl; toss to coat. Divide wings between prepared racks and spread out in a single layer, preferably not touching as they will be delectably gooey! Line another rimmed baking sheet with foil; top with a wire rack. Add half of wings to ginger-tangerine glaze and toss to evenly coat. Place wings in a single layer on prepared rack and bake until glaze is glossy and lightly caramelized, 8–10 minutes.